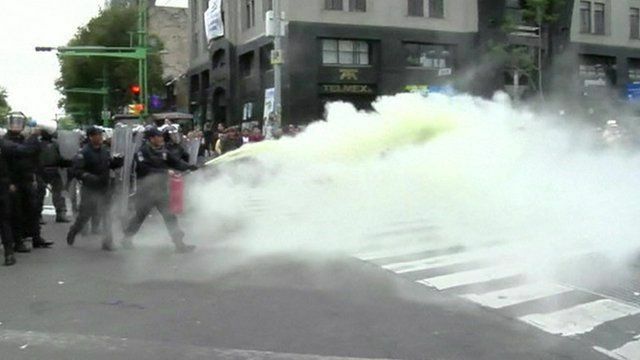 Mexico teachers clash with police Jump to media player Police in Mexico City have clashed with protesters during an operation to clear a square occupied by striking teachers. Mexican teachers clash with police Jump to media player Mexican teachers clash with the police, as their latest protest against education reforms brings traffic in Mexico City to a standstill. 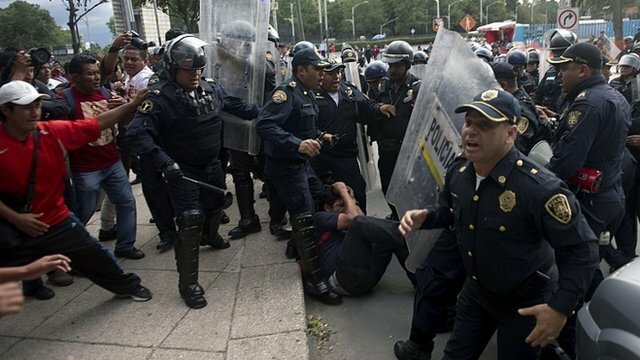 Police in Mexico City have clashed with protesters during an operation to clear a square occupied by striking teachers. Riot police, backed up by tanks and helicopters, broke through the barricades set up by the teachers shortly after a deadline for them to disperse passed. Some demonstrators responded with petrol bombs. The teachers have been demanding changes to education reforms approved by President Enrique Pena Nieto.